USATF Connecticut was well represented at the USATF Annual Meeting held in Orlando Florida from December 1st through the 4th. The following delegates from Connecticut represented all aspects of our sport. Associations – Bob Fontaine, Youth – Major Ruth and Bill Mongovan, Women’s Track and Field and Master’s Track and Field – Jim Barber, Race Walking – Maryanne and Ron Daniel, Men’s LDR and MUT – Morgan Kennedy, Women’s LDR – Kristina Miner, Master’s LDR and Cross Country – Ray Lapinski, Official’s – Yvonne Grimes. During Thursday evening’s Opening Session, USATF CEO Max Siegel and President Stephanie Hightower offered welcoming remarks to the constituents in attendance, focusing on messages of improvement and expansion of the sport and its support on every level. The Connecticut Association was ranked 6th out of the 57 Associations Nationally for outstanding Performance against the ten standards for Accreditation. As a result our Association was awarded $1,000 to be put toward programming to foster continued development of our sport. The top 15 Associations received monetary awards. Bill Mongovan has been awarded the Frank Seveign contributor to youth award as voted on by the Youth delegates . Each year, the USATF Youth Committee awards the Frank Seveign Award to the outstanding contributor to the continued growth and development of youth in our country. Frank Seveign was the long time college coach at Bowdoin College in Maine and later the University of Nebraska where he hosted the JO national track & field championship on numerous occasions. 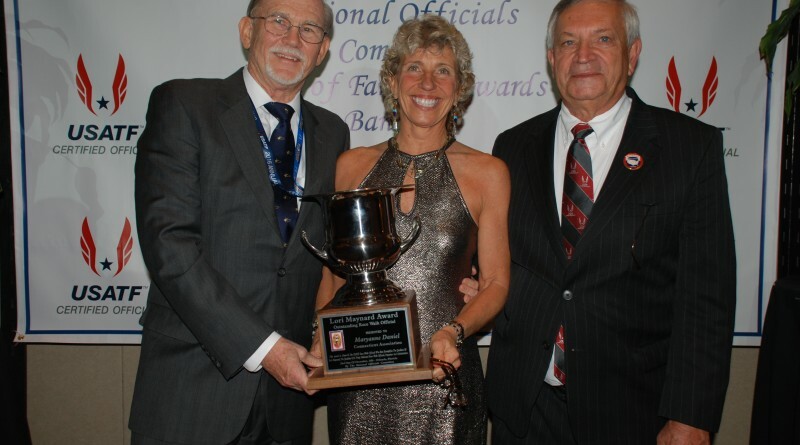 Maryanne Daniel was awarded the Lori Maynard Award by the National Officials Committee. This award is voted on by representatives from each Association and is awarded for outstanding service as a Race Walk Official, organizer, and administrator. Her husband Ron was the 2014 award winner.